January 2017 was warm over much of the Earth, but some cold spots stand out. Graphic courtesy of NOAA. After two years of extreme record-setting warmth fueled by a powerful El Niño, the earth is settling in to a more normal (for modern times) pattern of rising temperatures. On the heels of its announcement that the modest La Niña which followed the robust El Niño had ended, NOAA released its January global land and sea temperature report on February 16, 2017. Though the warm temperatures are not as spectacular as they were last January, the increases are spread rather uniformly over the globe — but with interesting cold anomalies..
Worldwide, January 2017 ranked third among all Januarys since 1880 for warmest average temperature. It was no surprise that January 2016 was warmer, with El Niñ0 still going strong, and January 2007 is still second. 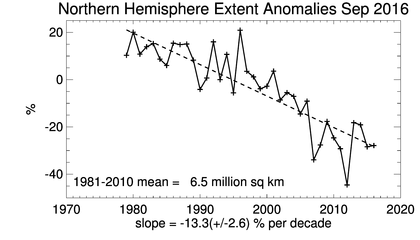 Of the nine categories that NOAA tracks, including by hemisphere, land, ocean, and global, six were in third place. Global and northern hemisphere ocean were both second warmest, and southern hemisphere land was fourth warmest. Within these general categories, there was considerable variation in temperature. The northwest US was quite cold, while central and northwestern Canada were much warmer than normal. All of Europe outside Scandinavia and the UK was cold, while most of Asia was warm. What’s Going On In The Arctic? The graph of arctic sea ice extent shows a decline from 1980 to 2016. The January 2017 satellite measurement reported by NOAA was a new record low for the month. Graphic courtesy of NOAA. Arctic temperatures have been near 10 C (18 F) above normal this winter. So it is not a surprise that sea ice extent was at a record low for January. Measurements of sea ice are taken by satellite, and the record goes back only to 1979. This January’s sea ice extent was 8.6% below the average of 1981-2010. Antarctic sea ice extent was also a record low for January. What Is The Actual Temperature Departure From Average? The globally averaged temperature for January 2017 was 0.88 C (1.58 F) above the 20th century average. If the increase is measured from the start of the industrial revolution, it is more than one degree C. This is already half way to the 2 C that most scientists believe could trigger catastrophic changes in climate and weather. The globally averaged temperatures are heavily influenced by the 70% of the Earth covered by water. Most people live on land; many live far from the moderating influences of large bodies of water. The departure from the 20th century average for land surfaces in January 2017 was 1.54 C (2.77 F). According to estimations by the U.S National Oceanic and Atmospheric Administration, the recent increase in atmospheric CO2 is greater than any in the record for hundreds of thousands of years. Graphic courtesy of NOAA. I will leave it to chemists to explain the precise reactions, but it is well known that fossil fuels react with oxygen to produce energy, water, and carbon dioxide. There’s a strong correlation of temperature with atmospheric carbon dioxide — they both begin to rise at the beginning of the industrial revolution, according to the American Chemical Society. The carbon dioxide molecule absorbs radiation in the microwave portion of the electromagnetic spectrum, while it is largely transparent to visible light. The sun radiates across the spectrum, but its radiation peaks in the visible wavelengths. The Earth, on the other hand, emits radiation that peaks in the microwave portion of the spectrum. Incoming radiation passes through the atmosphere, but some outgoing radiation is trapped in the carbon dioxide molecules as heat. Accepting the conclusion of scientists, that the burning of fossil fuels is the primary cause of global warming, 194 countries signed the 2015 Paris agreement to limit carbon dioxide emissions. Though a number of countries have already reduced emissions, widespread compliance with the agreement is not yet evident or assured. January 2017 was California’s seventh rainiest January in 123 years. Graphic courtesy of NOAA. Precipitation can be highly variable from month to month, but one significant trend over the past four years has been drought in California. January 2017 broke this trend, as California had its seventh rainiest January in 123 years of records. Storms barreled across the central Pacific, crossing the west coast and continuing eastward through the Rockies and the central plains. Six states from California to Kansas had one of their eight rainiest Januarys since 1895. February has continued to be rainy, and in the first six weeks of the year, in most of California, rainfall has exceeded the average for the entire year. But the rainfall deficit accumulated over many years has not even been half filled, so any celebrating is premature. Longer term forecasts indicate that conditions over the Pacific Ocean may revert to a less rainy pattern for the Golden State. Where Is The Temperature Going? The January data leave unclear whether the temperature spike of the past two years is simply a wiggle on the graph of global warming which has averaged about a degree C per century since 1880, or the start of an upward acceleration of temperature change. The latter would place added importance on rapid implementation of the Paris climate agreement.